So this morning a went straight back home after I drove the kids to daycare, ’cause I need to do some homework before I leave for school. When I was home I needed some breakfast, so I thought why not do a kind of Breakfast week on my blog. Why? Because I can, school is slowing down now because of the winter exams. Winter exams start in December. Now it is only endless homework to read over every thing that has been done this fall/autumn. This is a very much of a stable for my kids and my self. This is what they are serving in the daycare. Oatmeal! When I came home I threw oats, salt and water in a small saucepan. Let it boil for 5 minutes. 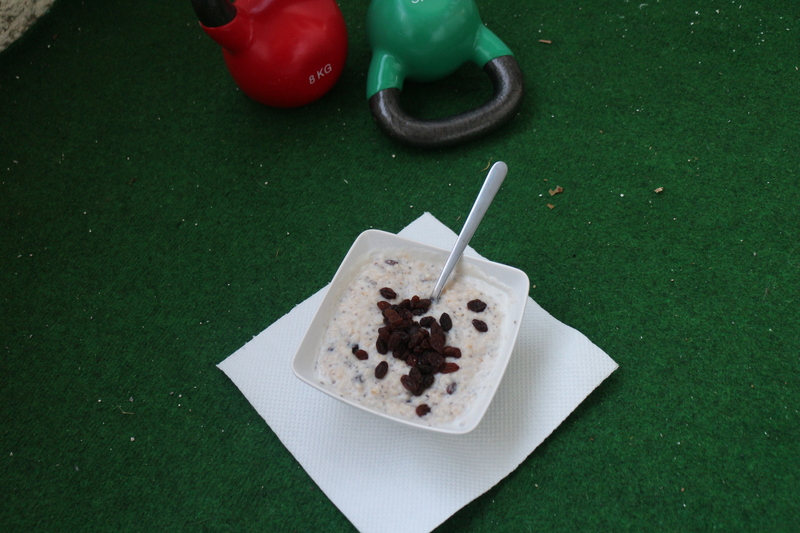 Went out to the balcony and did some kettle bell workout for couple of minutes and back in to eat my breakfast. It’s just a couple of things you need for this. Water to cover the Oats. After it’s ready I put in a Tbsp of Chia seeds. 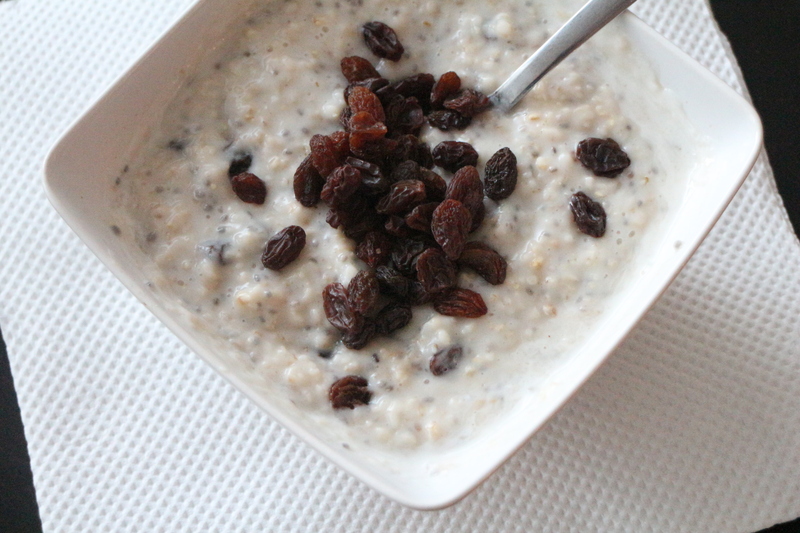 And my favorite thing about Oatmeal is to put a hand full of raisins on top and almond milk. Yummy ! 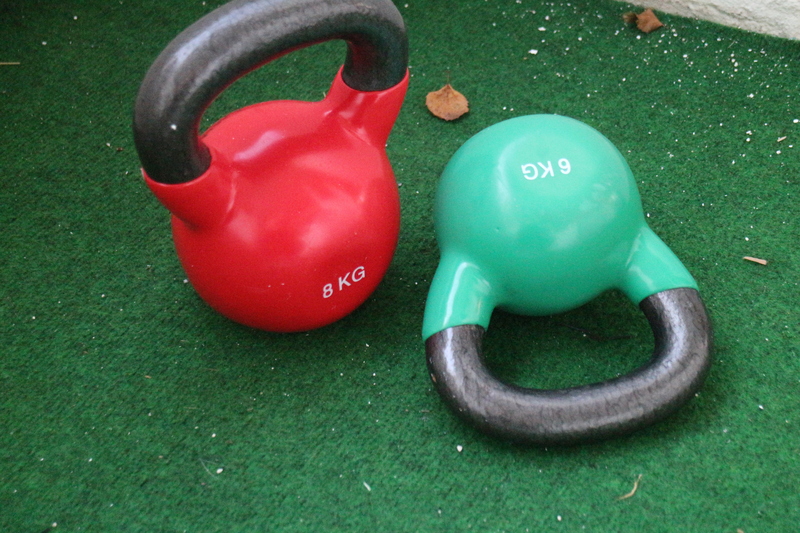 For the kettle bell workout . These days I like to go on Pinterest and see if I can find some short workouts like this one. Busy mom, does short/quick things. As you can see the leaves have fallen of every tree around here. And they are hiding on my balcony. I hope you try out my Oatmeal.